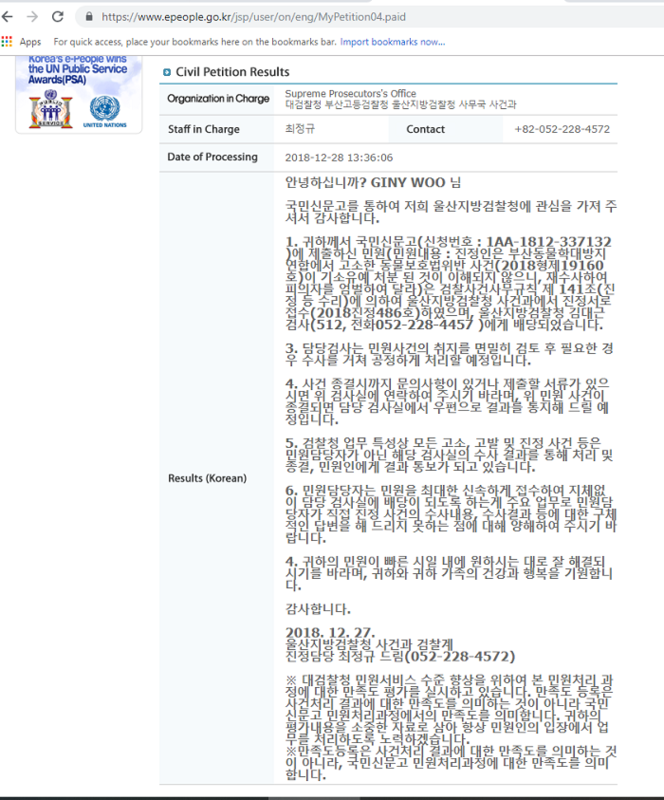 On December 27, we had received a response from a representative in charge of processing protest letters at the Ulsan District Prosecutors’ Office, Case Department regarding our petition: Ulsan District Prosecutor: Prosecute the animal abuser who struck a dog multiple times with a pipe in Ulsan, Korea. It states that my complaint, filed using e-people (Application No. : 1AA-1812-337132), regarding the request for re-investigation and strong punishment for the animal abuser, has been registered at the Ulsan District Prosecutor’s Office (2018 Protest No. 486), as well as forwarded to the prosecutor, Kim Dae-Geun. Our voices matter, and when we file protests using e-people, the Korean government is required to issue a response. So please add your voice to help make sure this criminal does not get away with cruelty to a helpless, restrained dog and send a message to the Koreans that this type of behavior will not be tolerated. Click HERE to take action today. Nothing will be done as the barbaric South Koreans think this behaviour against animals is fine. Well it is not fine. The government had better start doing something to end the cruel treatment of animals in it’s country.